Hello readers! I want to share about a fabulous children’s book that I used with my social skill students to kick off the school year. 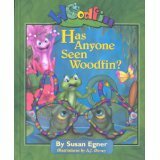 The book, Has Anyone Seen Woodfin?, by Susan Egner and illustrated by AJ Dewey, has been such a hit with my students!!! Woodfin is a precocious, adventurous little chameleon who likes to match the vibrant colors of the forest around him. But, his family worries about his safety when winter comes and the effervescent colors of summer fade to muted colors of winter where “ordinary” chameleons remain safe from predators in their camouflaged shades of green and brown. The message is to “be your true self”, and is captivating for children- and adults – of all ages! As a kick off to my social skill groups with my learners on the autism spectrum this fall, I wanted to find resources that supported a positive self-concept to start the year with optimism and excitement. I work with most of my students for 6 years (Kindergarten-5th grade) – through thick and thin. Some of the situations we work on are “thin” – there are certainly many occasions where I am supporting a child through social misunderstandings, feelings of social failure, and exclusion that sometimes result in subsequent feelings of confusion, anxiety or frustration. As I thought about returning to my students this fall, I wanted to find some tools to promote positive self-concept and celebrate individuality. Woodfin was just the ticket! My students enjoyed reading the stories, exploring the characters on the author’s website, creating crafts about Woodfin, and………..meeting the author!!!! Susan Egner has also published several e-book novels – available on her professional website: http://www.egnerink.com/ . 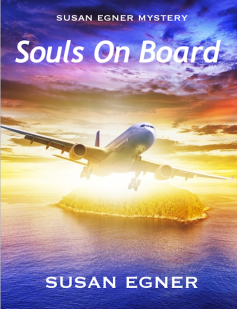 I think I will start reading the 1st novel in a series called, Souls on Board for some “fun” reading if anyone wants to join me in a virtual “book club”. I’ll bring the virtual wine, cheese and crackers…. Video-game obsessed students? 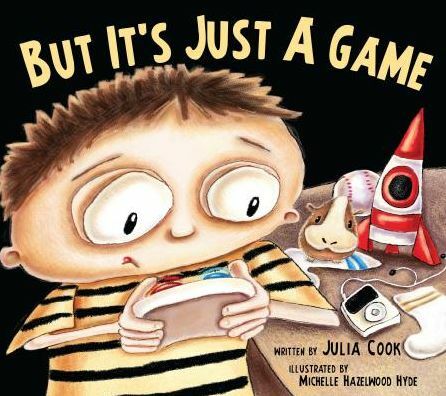 Check out Julia Cook’s new book… But, It’s Just a Game! Does anyone out there have a student or child totally obsessed with playing video games? Uh…I can definitely join those ranks! The gentle hum of the Xbox is a regular source of background noise in my own house. If you also have children – or students – that obsess about video games – have I got a resource to share with you! My favorite children’s author – JULIA COOK – does it again! The book, But It’s Just a Game, tackles the issue of video gaming and screen time taking over every aspect of a child’s social life, daily thoughts, and focus/attention skills. But It’s Just a Game, helps kids understand the difference between a “game controller” and a “life controller.” I love this metaphor! I read this book to my 4th and 5th grade social skills group – their conversation quickly revealed an immediate connection with the character, Jasper. Throughout the story, Jasper realizes how excessive gaming impacts his participation in sports, performance on his schoolwork, impacts his friendships, and his ability to listen and focus on others, just to name a few. This book was a springboard for my social skills crew to have an insightful, mature discussion about how gaming impacts their lives. This book is a wonderful resource to add to your social skills teaching library! It is truly a gem for your collection that tackles the topic of gaming and screen time in a way that paves the way for open discussion, decreases defensiveness in kids about this precious commodity in their lives, and teaches kids the importance of living with balance. Center for Engaging Autism – a Wonderful new web resource for families and professionals! In addition to providing web-based resources through blogs and articles for families all over the world, the Center for Engaging Autism also provides a variety of workshops for educators and caregivers in the Minneapolis/St. Paul area. Some of the recent workshop opportunities offered include topics such as: home design with your child with autism in mind, therapeutic toys beneficial for children with autism, engaging young children in early literacy learning, and grand-parenting skills for children with autism. I am pleased to be invited to present a parent workshop coming up on October 8th from 7-9pm in the Golden Valley, MN area, “Supporting Your Child’s Social Self-Esteem”. You can access the information at this link: http://cea4autism.org/whats-on/ – I hope to see families, educators, and community professionals at this event to learn how to support children’s development of confidence and self-esteem as they learn how to navigate the social world at school. Finally, one of the unique aspects of this organization’s work is the commitment to early Literacy development in young children. You can follow the Literacy blog at http://cea4autism.org/2013/01/literacy/ to see posts sharing information on starting kindergarten, apps for literacy development in young children,how to find books that are a good fit your child, and reading comprehension strategies, just to name a few topics. This would be a wonderful blog especially for preschool, early childhood, kindergarten, 1st, and 2nd grade teachers to follow! I wanted to take a moment to highlight a FABULOUS, must-have app for both iOS and Android platforms to go with the curriculum, The Zones of Regulation! The Zones of Regulation (2011 Social Thinking Publishing), written by OTR, Leah Kuypers is one of the very best resources I have found to work with students on emotional regulation. 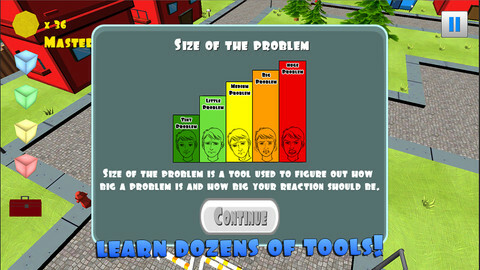 The tools in this resource weave together concepts of Social Thinking (Michelle Garcia Winner – www.socialthinking.com), the Incredible 5 Point Scale (Kari Dunn-Buron & Mitzi Curtis – www.5pointscale.com), and elements of sensory integration, into a comprehensive program to teach emotional regulation to students. 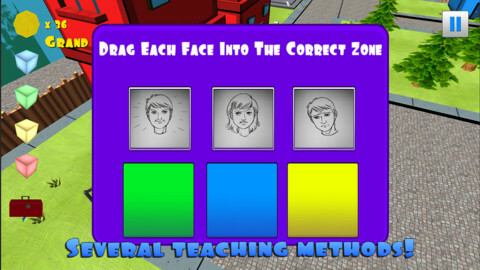 Using a cognitive behavioral approach, students are able to learn to categorize their emotions and levels of alertness into 4 colored “Zones”. Now, there is a mobile App to use to continue to reinforce skills learned! The app was released last week and has an unbelievable price point of $4.99 as of the date of this blog post. This app has it ALL! 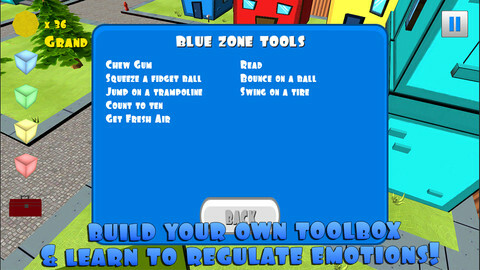 Throughout the app, students of all ages learn to tools to manage different feelings in each Zone, individualized “triggers” for particular Zones, and problem solving skills. 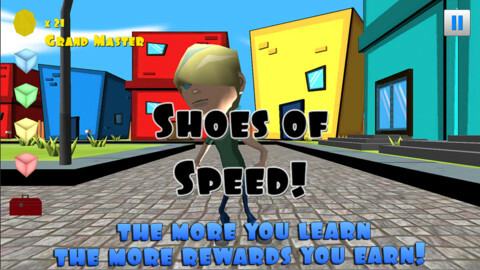 The app layout is a fun, interactive game to engage kids – teaching moments are interwoven throughout a game-interface where players can earn achievements, coins to earn extra “powers” or clothing for their characters, and challenges. This week, I used it with a very “spirited” group of six 2nd and 3rd grade students under the Autism Spectrum umbrella, and this app has kept them engaged for daily social skills group 5 days this week! This group can be a tough sell – but they have been excited to come back to group the next day! Here is a link to the Zones of Regulation website – if you do have this resource yet – put it at the top of your ordering list! Here are some screen shots: Get it TODAY!!! 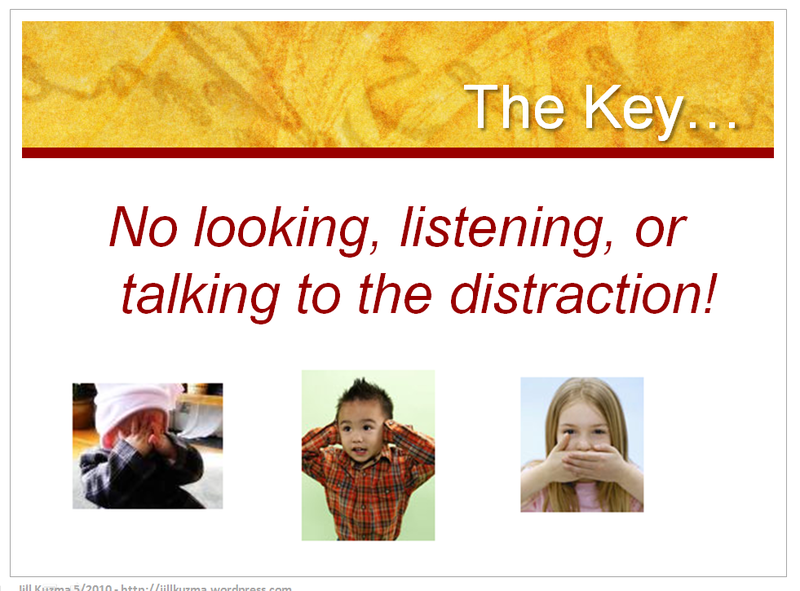 As you know, I have been working with kids on Attention/Focus skills – I wanted to highlight another tool I use with my elementary-age kiddos to teach them what “IGNORING” means. I often find that many of my kids don’t really implicitly understand broad concepts such as, “Use nice words”, “Respect others”, or “Ignore please.” I find myself needing to really concretely define what these concepts mean – in a way that literally describes what the concept “looks like, sounds like”, etc. Much of my caseload is composed of students on the autism spectrum, kids with ADD/ADHD, etc – and they need this level of defining. Simply asking them to “ignore” is too abstract for many of my kids to apply. They are often the kids who struggle the most with maintaining attention and focus – yet they are also the same students who cause disruptions in the learning of their classmates. 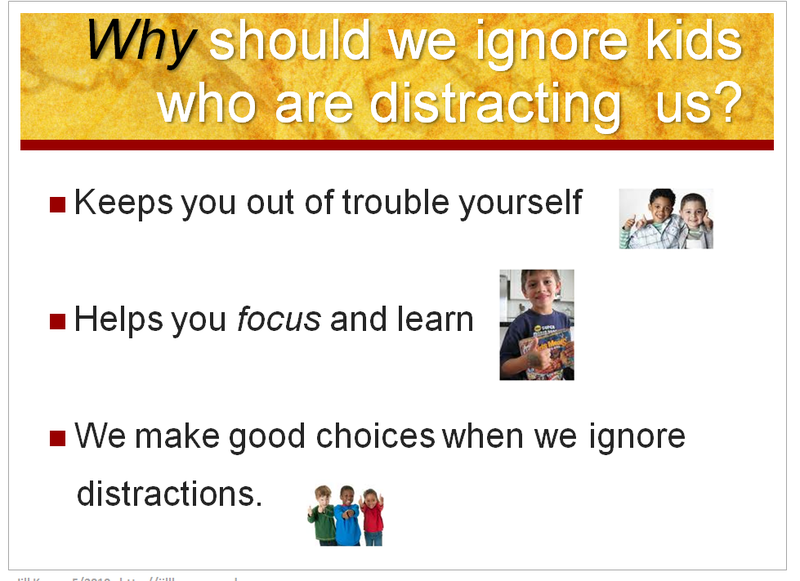 So, I created this little PowerPoint for kids to help them understand in a very direct, concrete way, what “Ignoring” means – how to DO it, and when NOT to do it…. I created some pictures of various ideas for “Inside the Brain” Distracter Blasters, and “Outside the Brain” Distracto\er Blasters. I spread the pictures out on the floor. As each child chose a picture, they described how the tool could be used to improve their attention, and what “kind” of Distracter type it would work for. Then, they got to count down 5 to 1 and proclaim “Distracter Blaster!! 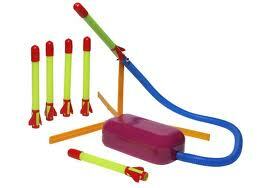 !” as they stomped on the air rocket (hoping to not injure a ceiling tile in my classroom). 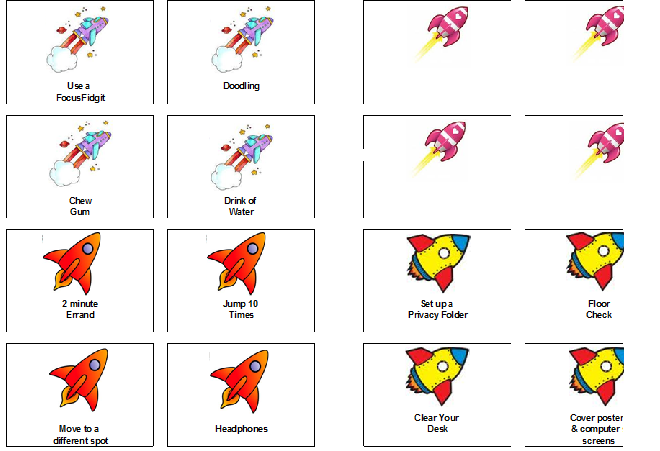 Have a great time Blasting Off with your students! 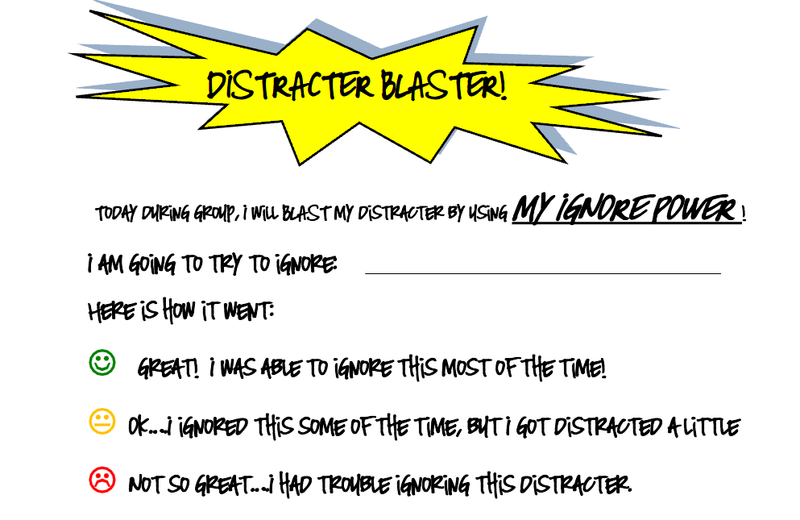 Watch the next post for a Self-Monitoring sheet for kids to determine if using a particular Distracter Blaster works for them. Lately I have worked quite a bit with my elementary students to teach them about how to improve their Attention & Focus skills. 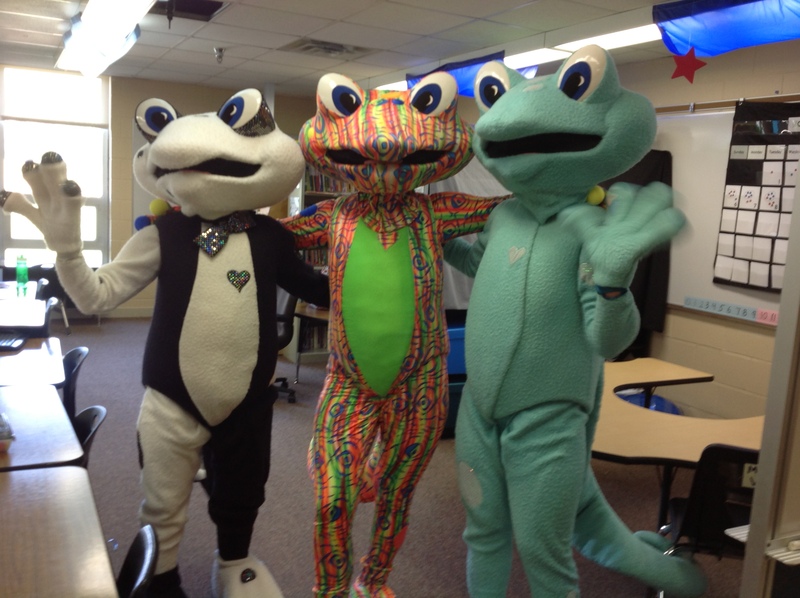 I have focused on my 4th and 5th grade students – and this has been quite the under-taking! Like all skills, I wanted to help my students understand what distracters were – then progress toward having them identify what kinds of distracters may be more prevalent for them individually. I taught them about “outside the brain distracters” – environmental influences on their learning, and “inside the brain distracters” – cognitive or emotional influences on attention to learning. We have done several activities surrounding this topic. 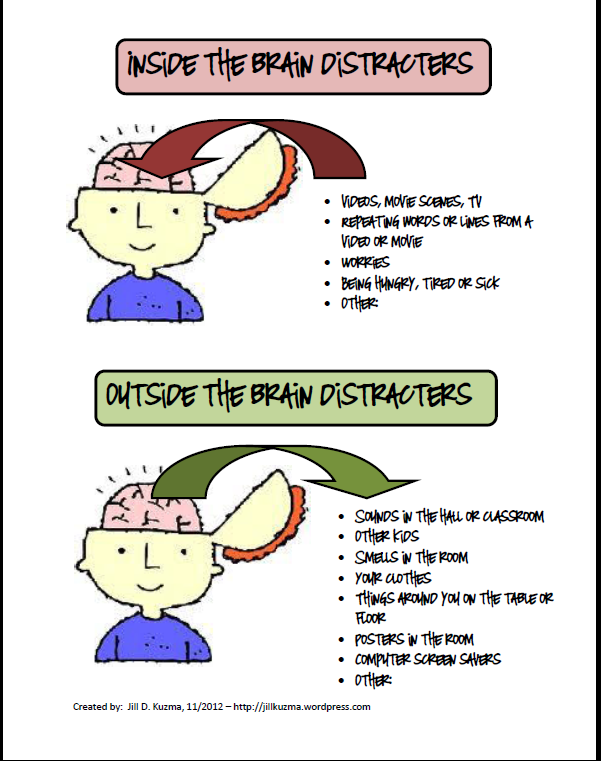 Here, I am posting a document with 3 parts: 1) Definition of the Types of Distracters, 2) a self-reflection sheet for kids to identify which specific elements may influence their ability to attend, and 3) some game cards to discriminate between “inside the brain” and “outside the brain” distracters. The link is at the end of this blog post. First, we explored the definitions of these two distracter types, with page 1 of the linked attachment. We talked about examples from each category, and brainstormed our own examples. On the file attached below, you will see that on the 3rd page, you cut out the Distracter examples, and if the example is an “inside the brain” distracter, the kids shove that little paper right into Ned’s nostril or ear! 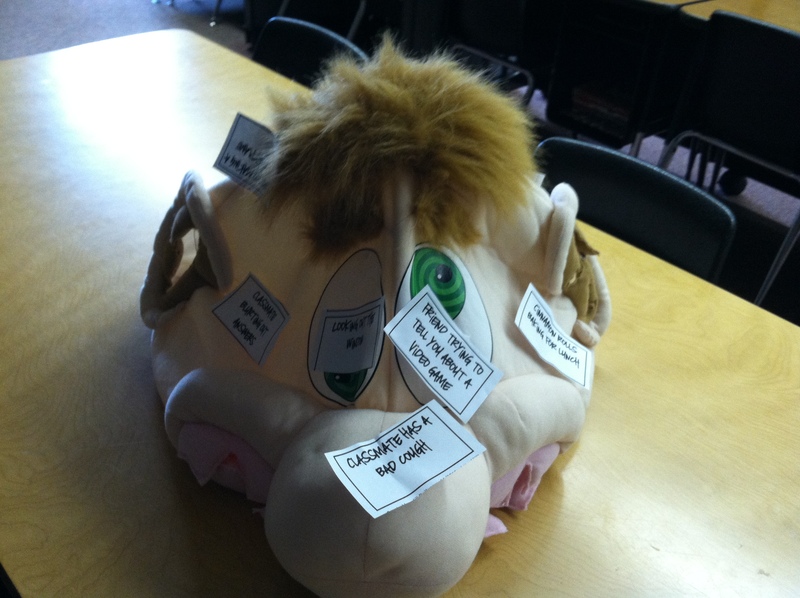 If it is an “outside the brain” example, we taped it right to the outside of his head. This was a ton of fun for the kids! 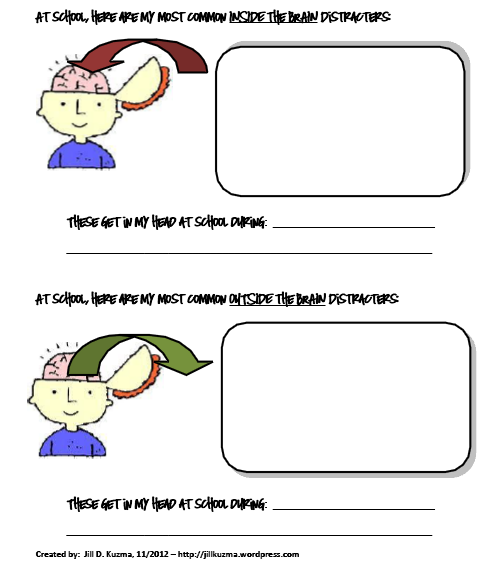 Finally, we used the 2nd page of the attachment for each student to think about what specifically distracts them at school. I also asked each child to take this sheet home and ask their parent(s) and siblings in their home what are some “inside” and “outside” distracters that impact them at work, school, etc. 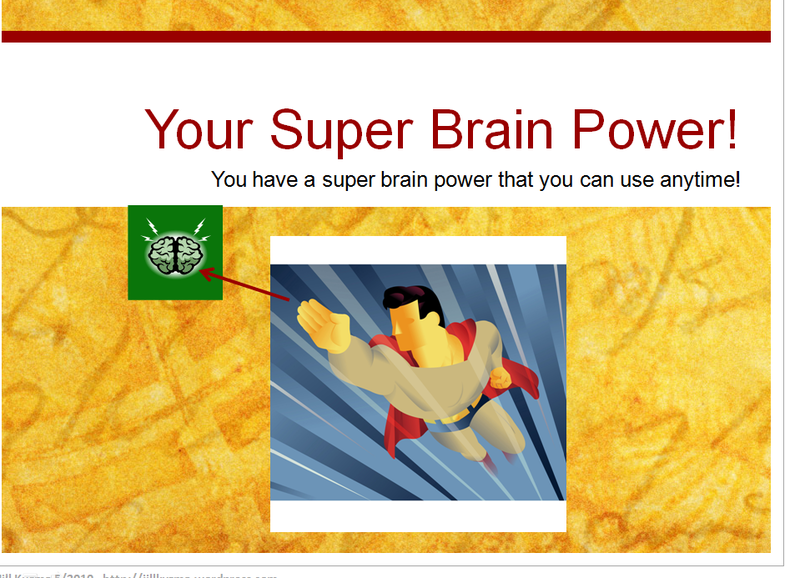 New Workshop for 2012-2013: Executive Function Skills! Executive function skills have come to the forefront in the world of education. Recent research suggests a strong correlation between students’ executive functioning their academic success. It also has been noted that deficits in executive functioning results in difficulty with organization, time management and task completion, problem solving, on-task behaviors and social interactions. Participants in the workshop will explore the impact of Executive Functioning on student learning and social interaction. The workshop is designed for all educators as attention is given to those skills needed by kindergarten through middle school students to be successful in a general and special education classroom. Participants will learn about the five domains of cognitive skills and will be given resource ideas and strategies that are designed to support strong cognitive skills in students. The strategies presented focus on skills that promote effective organization and time management, task completion, independent work, student goal setting and accountability. Additionally, the intervention ideas also provide a foundation to assist student self-monitoring, impulse control and emotional management. Jill is widely known for her energetic presentation style and for providing teaching ideas that are user-friendly and immediately applicable in the classroom. If interested in checking my calendar for a workshop for your group, check out the tab on this site called, Jill’s Presentations.